This "Skiing Manual--Skiing is a Sliding Sport" advocates a certain way of positioning oneself on skis and of moving one's body around that flexible position, i.e., of maneuvering while sliding. A lot of terms are used in describing this, and so a glossary is given in case any are not clear, for how will you know if you are performing the moves appropriately if you don't clearly understand the terms describing them? 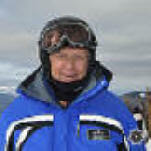 THE COMPLETE ENCYCLOPEDIA OF SKIING: the indispensable reference for instructors and all skiers, by Bob Barnes. Snowline Press: Silverthorne, CO. 1999, 324 pages of extended definitions. ISBN 0-9669131-5-9. CORE CONCEPTS FOR SNOWSPORTS INSTRUCTORS. Professional Ski Instructors of America: Lakewood, CO, 2001. 90 pages. Includes glossary. ALPINE TECHNICAL MANUAL: Skiing and Teaching Skills. Professional Ski Instructors of America: Lakewood, CO, 2002. 76 pages. Includes glossary. piste/off-piste: The piste is the main area of ski runs, often groomed. The off-piste is wild snow. graupel: snow that is more like pellets, sometimes called tapioco snow. An early stage in the development of hail from a thunderstorm cloud, so beware that lightning may follow soon. inclination: the skier's whole body is tilted, causing the ski to be tipped so the edges engage the snow more. Useful in high-speed turns so the skeleton bones are used for support instead of over-stressing the muscles and joints. anticipation: the angulated skier has already turned his torso toward the center of the new turn; his legs are yet to do so. blocking: In a turn a rotational force develops that can be blocked by a pole plant or an edge set. This allows some rebound from the skis acted as a spring, helping propel the skier into a new turn. boot-out: If a skier tips so much that his boot's sides drag on the snow, friction from that adds to the forces to be managed, often with negative result. Boot-out cannot generally happen for recreational skiers, for they can't/don't tip that much. A wide boot on a narrow ski would boot-out sooner. 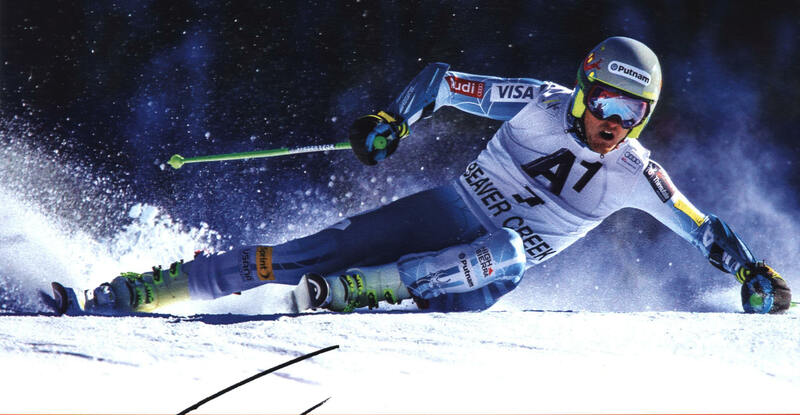 But now see the photo of Ted Ligety, who in this scene has four points of contact with the snow (outside ski, inside boot, seat, fist). Photo from back cover Ski, January 2016.
wedge/snowplow: a basic skiing maneuver in which the skis are posited by the skier with tips close and tails apart, causing inside ski edges to scrape the snow and thereby slow the skier. Snow slope, snow type, skier anatomy, and desired speed or braking are factors that determine the width apart of the skis' tails. A defensive ski maneuver, used mainly for slow speeds and tight spots. Often taught to beginners as a platform to develop skills for far more effective parallel skiing. braking wedge: a wedge that is wide at the skis' tails. gliding wedge: a wedge that is narrow at the skis' tails. christie: the classic definition is that of a ski turn in which the skis are parallel throughout but skid on their uphill edges. Short for Christiania, former name of Oslo, Norway, where the turn was invented. Some now use the term for a carved turn, so consider the context of use. wedge christie: A christie (classic) that starts from the wedge position and finishes with the skis parallel. The wedge can be closed at various points of the turn, with sooner closings indicating more advanced skiing for higher speeds and/or steeper slopes. stem christie: A christie (classic) that starts with only the uphill ski's tail displaced uphill from the other ski. Useful in situations where it is desirable to engage the snow more with the downhill ski as a platform for the turn to begin, as in doubtful snow conditions or in learning to ski parallel for some who hesitate at moving the body across both skis at once. With the stem christie that move can be done in two steps. parallel christie: A christie (classic) in which the skis are parallel throughout and dragging on corresponding edges (both dragging on the downhill edges, for instance). Skidding of the skis is expected. An excellent way of scrubbing speed from friction as well as from the turn's change of direction. telemark turn: A turn done on skis that have bindings allowing the ski boots' heels to be raised from the ski. Done the opposite from a turn on alpine skis, the outside ski is advanced into the new turn first, creating an angle with the uphill ski whose tail moves outward. The name is from the Telemark region of Norway, where the turn was invented. retraction: A movement in which the legs are brought upward toward the torso. Useful in bumps, powders, and some racing situations. extension: A movement in which the torso is moved upward from the legs. For this to happen the legs must initially have been bent--much as in preparation for a jump from a flat floor. camber: A change in curve on a ski. The sides of skis are usually not straight, but wider at the tips and tails than at the waist. The bottoms of skis are usually not straight, either: held together, tips and tails of skis normally touch although the waists do not. This is classic base camber. Reverse base camber is when the waists touch but the tips and tails do not. sidecut: The amount of deviation of the ski's sides from a straight line. rotation: Turning the upper body in the direction of the new turn to cause the skis to turn also. Note that to do this an "anchor" is needed else the lower body will also turn, as in the air. For instance, one cannot change direction once detached from earth even though one can twist the body and gravity can produce an arc in the vertical plane. To rotate on skis, thus, one has to engage edges or create enough skidding friction to grip the snow. This concept may seem elusive as we are used to always being anchored on floors or ground where we always have the feet secured. shaped skis: Skis that have more sidecut than was formerly used. Also called parabolic, new, modern, etc. The amount of shape can be varied in manufacture to produce turns of differing radiuses. sidestep: With skis parallel, moving one ski at a time with bases tipped so at least one edge is always engaged--to go uphill or downhill. sideslip: With skis parallel, tipping the ski's bases into angles nearer the snow slope so that the skis slip downhill. In the flatter positions, skis slip faster. Edges will scrape. slip: A scraping of ski edges against the snow. Produced by tipping the skis at angles nearer the snow slope. skid: A slip while in a turn. Could be more or less depending on angle of ski's base to snow slope. Can be used to reduce speed. carve: A turn in which the skis do not skid. Skis are tipped sot hat edges remain engaged throughout and parallel lines are left in the snow. This retains the most speed in a turn but does not produce the tightest turn, which requires skidding. It does produce delightful sensations. skate: Moving forward by stepping off a slightly tipped ski to move one ski ahead of the other with its tip pointed outward from the body, lunging forward and then stepping the other ski ahead the same way. Same as roller skating or ice skating. stem: Moving one or both skis so the tips remain close while the tails are apart. Typically produces friction that can slow or be used to deflect one into a new turn. step: Picking one ski up and moving it forward, sideways, or back, then placing it on the snow. tactics: Selection of ski maneuvers for particular situations or conditions. traverse: skiing across a slope at a slight descent, typically with skis parallel. weight transfer: shifting weight from one ski to the other, done partly or wholly. unweighting: upward movement which when stalled by the skier causes momentarily lightening on the skis. Think of a jump that does not leave the ground. mogul: a bump on a ski slope, caused by skiers making turns in the same places. Requires adaptaion of parallel skiing technique. chicken-heads: Short frozen columns on a ski surface that can catch a ski and trip its rider. Occurs rarely in spring. death-cookies: Round frozen columns on a ski surface that can catch a ski and trip its rider. Occurs rarely in spring. triangular sustentation: Planting a ski pole downhill with a blocking action and in a pattern that produces a triangle among the pole and the ski boots, creating a stable platform from which rotation can produce a turn. Useful in difficult snow situations. leverage: Tipping the body against the ski boots and bindings so that more or less weight is placed fore and aft. More commonly applied aft. parallel: Skis, ski tracks, etc., that are the same distance apart. The tracks may be in arcs as they are on railroad lines. hop turn: A turn down during a leap into the air. To apply the needed rotation, the leap must occur from skis that have a purchase on the snow. crossover/crossunder: Crossover is movement of the torso across the skis, typically from the uphill side to the downhill side; or the reverse, crossunder is movement of the legs under the body and across the skis, with the torso following. anticipation/release: Turning the upper body toward the new turn before the legs and skis. To do this, the skis must have sufficient grip on the snow to apply the needed force and/or the ski pole has to be planted firmly with tension to block the rotational force. Then with the built-up muscle tension, the skier relaxes as the skis flatten so the stored force propels the legs and skis around. Useful as a defensive maneuver, especially in moguls to alter line. Also produces short-radius turns. blocking: Creating a stopping force to slow or end the rotation of the body that occurs during a turn. Done by engaging skis's edges of with a tensed pole plant. cant: No-no word for skiers aspiring to new challenges. Also the tipping of ski boot soles at angles to the skis by removing some of the sole or placing wedges under the boots. Too, just the upper part of a ski boot may have adjusters to change its angle with the lower. diverging/converging/parallel: Ski positions in which, respectiely, the ski tips point outward, inward, or are the same distance apart as the tails. drill/bag of tricks: Exercises designed to discover or sharpen particular ski skills so they can be applied to skiing. down stem/upstem: Displacing (Stemming) either the downhill or uphill ski as a turn is begun. flexion: Bending the legs at the knee to lower the torso. fall line/gravity zone/rise line/: The fall line or gravity zone is the most direct line down a snow slope, the course which water will follow. The rise line goes the opposite way, up the slope. spill zone: What direction you would fall and how far you would slide. Spill zone depends on if stopped before falling, if skiing and how fast, where in turn fall occurs, slickness of snow surface, steepness of snow slope. Concept encourages consideration of location of other skiers, trees, etc., while choosing tactics, speed, etc. footbed: An inner sole that slips into a ski boot to hold the foot and ankle consistently in position. It overcomes the tendency of the foot to tip sideways from the leg at the ankle joint and thus makes edging of the ski more precise. alignment: Adjusting ski boots to get the leg and ankle joints in a position of maximum range of motion and maximum strength. Involves canting of ski boot soles and tipping of boot cuffs to best match natural angle of one's legs (if bow-legged, knock-kneed, etc.). Includes use of footbeds. garlands: a ski exercise involving tipping and un-tipping of skis to produce zones of slipping and lines of traversing. This produces a garland track in the snow. Doing garlands primarily teaches the edging skill, but is also used in skiing to deftly move downslope or across the slope to avoid obstacles or take advantage of snow, changing line but not turning. falling leaf: Descent of snow slope by side-slipping alternately forward and backward using a combination of tipping/untipping skis and leveraging fore and aft. Excellent exercise for learning skiers and now also used for learning snowboarders. gliding: Skiing in a way that maximizes the use of gravity and ski shape in creating turns. herringbone: Method of climbing hill by taking steps from tipped skis, one at a time. Track left in snow resembles fish skeleton. hockey stop: Quickly pivoting the skis with the legs under the torso from skis flat to the snow slope so the skis begin slipping perpendicular to the body's direction of travel. As friction develops from this and slows the skis, the skier balances against this force by leaning uphill. Practice teaches the appropriate amount of lean for a given slipping force, the force of which depends on snow slope, speed, ski maintenance, anatomy, snow type, and quickness of pivot. An important skill used to slow or stop. Same as used in ice hockey. Kids tend to pick it up quickly; adults struggle learning it. 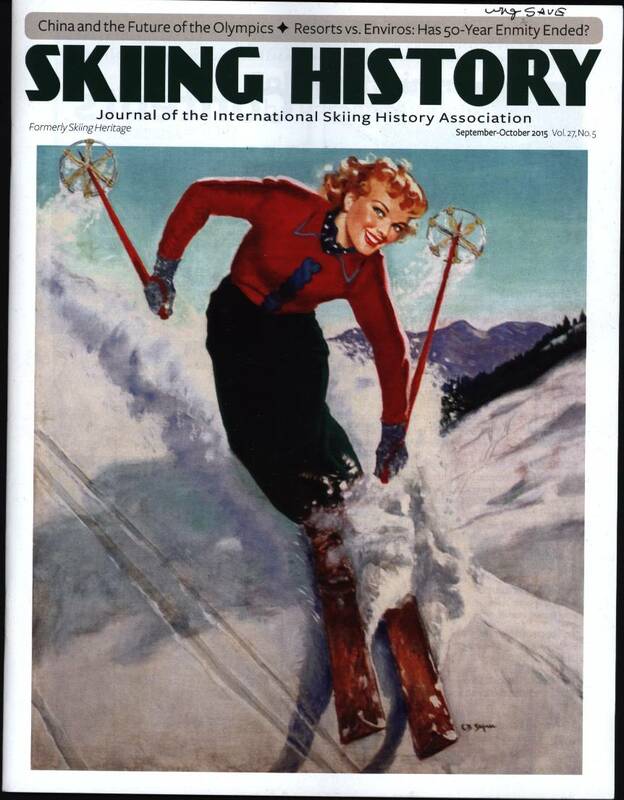 Before the era of shaped skis, it was easier to learn because skis slipped and skidded more. matching: Moving one or both skis into a parallel situation after being stemmed. railroad tracks: Parallel ski lines in the snow, produced in carved turns where ski design and tipping cause the turn rather than a rotational force. open-stance parallel: Skis are parallel throughout turn but wider apart than usual. Provides stability but can lead to skiing on inside edges if too wide. albedo: Reflectivity of the snow surface. More light is reflected from new snow when the crystal edges are still sharp. Wear sunscreen and sunglasses then, especially. This "Glossary" page last modified 11/03/2017 07:21:40 AM. Did you come here from a link on another website? For latest version of this page, copy to your browser: http://www.SkiMyBest.com/skigloss.htm. Copyright © 2013, 2014, 2015, 2016, 2017, 2018, 2019. William R Jones.